Slate roofing tile has has been around for centuries, and is generally known as one of the highest quality, longest lasting roofing materials on the market. Slate roofing tiles are cut from metamorphic rock which is highly durable, making it a perfect roofing material to be split in one direction into sheets of various thicknesses. It is cut and trimmed mostly by hand labor into the required sizes and thicknesses. 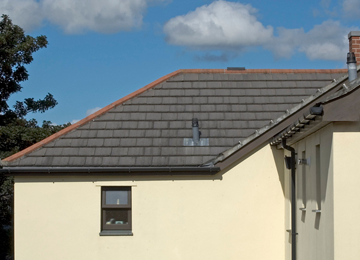 A slate roof is really a custom-made job and its use gives a building its own look. A properly installed Slate roof can last put to 150 years or more!